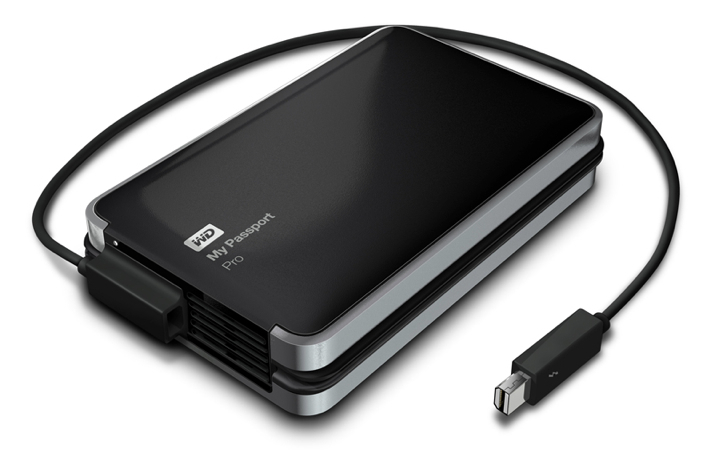 Western Digital today announced the new My Passport Pro, the company's first thunderbolt-powered, dual-drive storage solution. With user-selectable RAID functionality, the drive is suitable for graphics professionals looking for high performance or consumers who need reliable mirroring. The aluminum enclosure accommodates two 2.5-inch drives, providing a total of 2 TB or 4 TB of storage space. Because it connects via Thunderbolt, the drive is powered by the bus itself and requires no extra cables and no external power source. It also delivers transfer speeds of up to 233 MB/s. Superior to both FireWire 800 and USB 3.0, the integrated Thunderbolt technology of My Passport Pro makes video manipulation quick and easy—with the ability to copy a 22 GB high-definition video file in half the time typically required by a USB 3.0 drive working in RAID 0 format. The My Passport Pro is available now at other major electronics retailers, including Apple, and online from Western Digital. The 2 TB My Passport Pro costs $299.99, while the 4 TB model is priced at $429.99. I wish thunderbolt was cheaper. So after several years the first thunderbolt powered drive is announced. It's nice, but I'm always concerned by drives even SSD's that require power from a Logic Board....I know, It works, but my own theory is that it shortens the life of the PSU. If they release a version with an external PSU I'm in. Turning no your computer also shortens it's life, so does using it and so does letting it sit there. Sounds like your best bet is not buying a computer if you want the longest life out of it. I do wonder what the price of a plain old diskless Thunderbolt enclosure would come down to if a few companies started producing them in 2.5" and 3.5" flavours. a) The WD can be configured for RAID 1. Most people may not even care, though. What if it doesn't reach? I haven't seen any thunderbolt extension cables around, and as they're active cables that could be tricky. Neat cable storage solution - OK, captive cable: No. No Thunderbolt daisychain port: FAIL. As much use as a chocolate teapot for my 2011 MBP which only has 1 TB port, which is plugged into a display whenever I'm at the desk. Not so bad with the newer MBPs and iMacs that have a second TB socket but, even so, this is hogging a big chunk of your expansion capacity.